His Excellency Prime Minister Dr. Haider Al-Abadi has received Mr. Hiroyuki Ishige, Chairman, and CEO of The Japan External Trade Organization's and his accompanying delegation at his residence in Tokyo. They have discussed the entry of Japanese companies to work in Iraq and the implementation of projects in all fields, Mr. Ishige has stressed on the desire of Japanese companies to invest in Iraq and its intention to visit Iraq sooner to see these projects, He has added that the organization has the desire to expand its office in Iraq after the security situation stabilized, indicating that they will encourage their companies to work in Iraq. 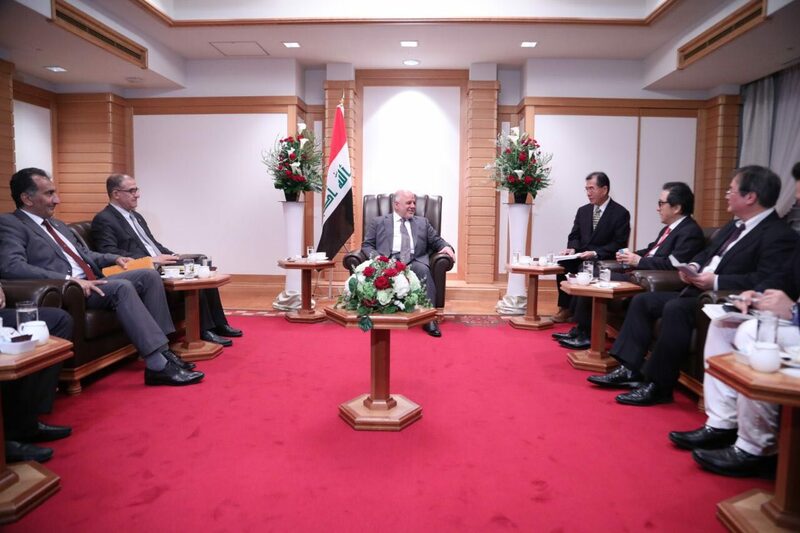 Dr. Haider Al-Abadi has stressed the importance of cooperation with Japanese companies after the transition of Iraq to the stage of construction and rebuilding, as it won a victory over Daesh and liberating the entire territories of Iraq and gain citizens' support alongside the state. He has added that there are Japanese companies in Iraq, including the company that works in the water of Basra, it is important to continue the work of Japanese companies that have considerable experience in many sectors.